NASHVILLE, Tenn. – (June 26, 2015) – Francesca Battistelli’s 2014 album If We’re Honest has yielded its third consecutive No. 1 single as “Holy Spirit” reaches the top of five charts in an astounding 13 weeks. “Holy Spirit” raced up the charts even faster than previous multi-week No. 1’s, “Write Your Own Story” and “He Knows My Name,” bringing her career total to five chart-topping songs. Battistelli was already a rising star in the Christian music world with more than 1.5 million units sold, six Dove Awards and three Grammy Award nominations. But If We’re Honest has pushed her to a new level. “Holy Spirit” reached the top of the BDS National Christian Audience, AC Monitored, AC Indicator, and Soft AC charts and Mediabase’s Christian AC chart. A leader in the music industry for over 60 years, Word Entertainment, a Warner/Curb company, is a unique, comprehensive faith-based company comprised of multi-faceted artist service departments including publishing, merchandising, booking and online initiatives. Word Entertainment represents some of the top names and brands in music, including About A Mile, Meredith Andrews, Chris August, Francesca Battistelli, Big Daddy Weave, Blanca, Jason Castro, Everfound, Family Force 5, Jon Foreman, for KING & COUNTRY, Group 1 Crew, Love & The Outcome, Dara Maclean, NEEDTOBREATHE, Point of Grace, Sidewalk Prophets, Skillet, Stars Go Dim, Switchfoot, VERIDIA, We Are Messengers, We As Human and Zealand Worship, and is home to 25 Entertainment, Word Distribution (representing Curb Records and Big Idea/VeggieTales among others), Word Church Resources, Word Films, Word Music Publishing and Word Label Group’s Word Records, Word Worship and Fervent Records. NASHVILLE, Tenn. (June 25, 2015) – Creation Festivals partners Pastor Harry Thomas (Co-Founder and Executive Producer) and Troy Duhon (Executive Producer) are thrilled to announce an exciting new component of Creation Festival Northeast: live streaming! For the first time ever, the evening programming will be live streamed/simulcast. Creation Festivals is joining forces with Blue Scout Media and University of Valley Forge to produce the live streaming programming. Blue Scout Media, which has produced such major live streamed events as Disney’s Night of Joy and WinterJam, among others, is a Waco, Texas-based communications services company with a wealth of experience producing and distributing live coverage of everything from large multi-stage, multi-day festivals to intimate coffee shop shows. The Creation Fest programming will be streamed via Blue Scout Media’s Stagehop.com platform (stagehop.com/creationfest). “We believe the addition of live streaming will allow Creation Fest to go worldwide, In doing so, we expect to expand our mission from reaching tens of thousands to potentially hundreds of thousands of people with the Gospel during the course of the week,” explains Duhon. (Minnesota/Wisconsin), Creation Ichthus Festival (Kentucky), and Creation Festival Northwest (Washington). This year, they will work with Pure Flix’s God’s Not Dead II: He’s Surely Alive (pureflix.com), MyHealthyChurch.com and The Human Right (thehumanright.org) with Heath Adamson to add expanded awareness of both the physical festivals and the live streaming events. “Over the years Creation has seen tens of thousands of lives changed by Jesus Christ at these festivals, and we see them continuing as powerful outreaches to bring the active and living Gospel of Christ to people of all generations,” says Thomas. “We have dedicated ourselves to use music, the spoken word, film, the arts and now advanced live streaming technology to spread the Gospel. “Premier destinations, combined with our continued commitment to excellence that offer great ministry and outreach, enhanced experiences, added value, and better convenience, guarantee your time at a Creation Festival will be the highlight of your summer, and maybe your life!” continues Thomas. For more information, visit creationfest.com. To view the Live Simulcast, go to stagehop.com/creationfest. 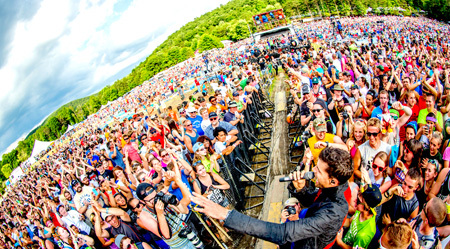 Creation Festivals is the oldest and one of the largest operators of Christian music festivals in the United States. We exist to present the Gospel through music, teaching and any other creative means so that those attending will be drawn to salvation and discipleship in Christ. We come together by the thousands to “Give Tribute to Our Creator” and to allow His Spirit to birth many as “new Creations” in Jesus Christ who will love and serve Him. Nashville, Tenn. (June 24, 2015) Unbroken Praise, the newest release from double-GRAMMY ® winner Matt Redman, has garnered the top spot on the Billboard Christian Albums Chart. Unbroken Praise marks Redman’s second, consecutive debut to take the No. 1 place on the chart upon it’s release. Continuing to take his music all around the globe, Redman will be bringing Unbroken Praise and his other well known songs to audiences in the U.S. and abroad throughout the rest of 2015, including Chris Tomlin’s Worship Night in America, which will bring people across the country together for a time of worship and prayer for the nation. Events will take place Aug. 8 in New York City’s Madison Square Garden, Aug. 13 in Denver’s Red Rocks Amphitheater and Aug. 15 in Sacramento’s Sleep Train Arena. To see Redman’s latest tour schedule, click here. Matt Redman is a key songwriter for today’s church and active worship leader for Passion conferences around the world. Leading a generation of worshipers, his songs have been recorded by Chris Tomlin, Michael W. Smith, David Crowder*Band, Israel Houghton, Jeremy Camp, Jesus Culture and Passion, among others. Redman has over 40 songs in the CCLI Top 500, with six populating the Top 500. Among his powerful well known songs, “10,000 Reasons (Bless The Lord)” earned Redman his first two GRAMMY® awards, was certified RIAA Platinum and named ASCAP’s “Christian Music Song of the Year” and “Top Christian Song” at the Billboard Music Awards. Your Grace Finds Me debuted at No. 1 on the Billboard Christian Albums Chart and in the Top 30 on the Billboard 200. Most recently, his long awaited new album Unbroken Praise debuted atop the Billboard Christian Albums Chart. (NASHVILLE, Tennessee) — Contemporary Christian singer/songwriter, worship leader and speaker Laura Kaczor (kuh-ZORE) has announced that her fourth album, Restore Me (LifeThirst Music), will be released on July 10th. Kaczor wrote or co-wrote all ten songs on the new album, which is produced by Dove Award-winning Producer of the Year, Ian Eskelin (All-Star United, Francesca Battistelli, Kutless). The new album is deeply personal to Kaczor, birthed in trials, fears and struggles, but full of hope, faith and trust found in the unfailing, unconditional love of a Savior that restores us. That theme of restoration emerges throughout the album, but most notably in the first radio single, Forever, which is a powerful song of commitment, surrender, salvation and the Lords faithfulness. Little did Kaczor know that the song would soon strengthen her and her husband Kelly through a difficult pregnancy and then the open heart surgery of their precious son Samuel. Restore Me is the follow-up to 2010s Love Enough (LifeThirst/Universal), which was produced by multi-Dove Award-winner Don Koch (NewSong, Phillips, Craig & Dean, Avalon). The album gave her four Top 25 Billboard radio hits with 10 consecutive weeks in Billboards Top 20 and led NewReleaseTuesday to name her as one of the Top 10 new female Christian artists. With a music career that has spanned over a decade, Christian Hip Hop artist FLAME adds an 8th album to his discography. His last album, Royal Flush, released in 2013 and garnered a Dove nomination for Rap/Hip-Hop Album of the Year. The album included hit single, “Start Over” which received nearly 2 million views on YouTube and radio play on contemporary urban stations. This summer, hip-hop fans will be able to get there hands on FLAME’s newest album titled Forward. Forward is set to release July 17, 2015. “The world is changing at such a rapid speed that it is important for us to evaluate what is happening and to consider what would be the best way to move Forward. In this album, I discuss the global climate as well as the climate in America and how we can move forward by engaging culture with the gospel,” stated FLAME. Themes include the necessity to move forward, which is communicated in songs “1st Freedom,” “Know the Times,” “Positively Eternal,” and “Believe That,” a bass heavy track with a live performance feel. Songs such as “Move Forward” and “We Gon’ Reign” provides the listener with motivation and encouragement to move forward in the midst of challenges. The album also includes the song “Let it Shine” featuring a powerful performance by Dove-nominated gospel artist Melinda Watts. Catch a preview LIVE on FOX & Friends Weekend Sunday morning! Nashville, Tenn. (June 19, 2015) – Unbroken Praise, the newest album from GRAMMY® winner Matt Redman, debuted this week amongst critical and listener acclaim alongside capacity-filled tour dates, performing for 2,500 in Fort Meyers, Fla. and 2,200 in Orlando, Fla. alone. After it’s release earlier this week, Unbroken Praise has sat atop the iTunes ® Christian & Gospel Chart. Media mainstays such as CCM magazine have chronicled Redman’s recording of his newest album at the legendary Abbey Road Studios. Additional outlets are resonating with Redman’s newest release. On the heels of Unbroken Praise’s debut, Redman was honored last weekend for the RIAA Platinum certification of “10,000 Reasons (Bless The Lord).” The song also made Redman a double GRAMMY® winner. Touring all over the world, he has brought his live music to over 30 countries. A committed songwriter, Redman continues to craft songs for some of the most respected names in the church, and has over 40 songs in the CCLI Top 500. Continuing to take his music all around the globe, Redman will be bringing Unbroken Praise and his other hits to audiences in the U.S. and abroad throughout the rest of 2015. To see Redman’s latest tour schedule, click here. Matt Redman is a key songwriter for today’s church and active worship leader for Passion conferences around the world. Leading a generation of worshipers, his songs have been recorded by Chris Tomlin, Michael W. Smith, David Crowder*Band, Israel Houghton, Jeremy Camp, Jesus Culture and Passion, among others. Redman has over 40 songs in the CCLI Top 500, with six populating the Top 500. Among his powerful hits, “10,000 Reasons (Bless The Lord)” earned Redman his first two GRAMMY® awards, was certified RIAA Platinum and named ASCAP’s “Christian Music Song of the Year” and “Top Christian Song” at the Billboard Music Awards. Redman’s last album, Your Grace Finds Me debuted at No. 1 on the Soundscan Christian Albums Chart and in the Top 30 on the Billboard 200. His long awaited new album Unbroken Praise is now available. Dallas, TX (June 4, 2015) —– CCM artist, Natasha Owens, is scheduled to release her sophomore project August 28th. No One But You was produced by award-winning producer, Ed Cash, with Cash co-writing all five songs on the EP. The title track is the first single and is currently going for adds at Christian radio, with airplay at WDJC/Birmingham, AL, WWWA/Winslow, ME, WJYO/Ft. Myers, FL and WLBF/Montgomery, AL. No One But You will be available at all retail and online music outlets. Owens brings impressive credentials with her new record, as she was featured on Jason Crabb’s 40-city tour last year and will appear on TBN’s Praise The Lord later this summer when Crabb serves as host for the evening. Owens has also shared the stage with other high-profile performers such as Michael W. Smith and Sanctus Real. In 2014, Owens released her first national album, I Made It Through, which was featured in CCM Magazine and received a stellar review from Music News Nashville that called her, an amazing artist/singer. No One But You delivers an overall powerful message of restoration and healing that magnifies how God will continually provide support and carry us, no matter how desperate the situation or how big the obstacles are. Each track, while beautifully unique in its own right, illuminates the idea of rising above. The record’s, “Move Me,” chronicles the struggle Owens experienced upon learning of her father’s early and unexpected death, while the ballad single explains her season of grief and struggle. “We Will Rise” announces God’s victory over death, as her father’s tragedy helped to lay the foundation for what would become the next chapter in her heart, her healing and her ministry. With a clear direction for her new project, Owens teamed up with industry heavyweight, producer Ed Cash. It was only one meeting explaining her heart behind the new record that landed him squarely in the production chair. “Natasha’s story and heart are very compelling and that comes out in her voice and songs. She is a wonderful picture of the healing hand of God and the joy that he alone can bring through pain,” adds Cash. For more information about Natasha Owens and No One But You please visit online, www.natashaowensmusic.com, www.facebook.com/NatashaOwensMusic, www.twitter.com/tashaownesmusic. NASHVILLE, Tenn. – (June 4, 2015) – More than 2,500 K-LOVE Fan Awards Weekend attendees helped celebrate Big Daddy Weave on Saturday night, May 30, 2015, for a sizzling run of hits. And that was just the start of the fun. Big Daddy Weave lead singer Mike Weaver, Word Entertainment President & CEO Rod Riley, K-LOVE Fan Awards Co-Creator and Producer John Sanders and David Pierce, Chief Creative Officer at K-LOVE and Air1, spoke during the Saturday evening ceremony. Then, on Sunday night during the K-LOVE Fan Awards at the Grand Ole Opry House, the band learned it won the fan-voted Artist to Appear on a 7UP Can Award presented by Pepsi, which means their image will adorn 3 million 7UP soda cans later this summer. Big Daddy Weave is one of Christian music’s biggest headlining artists, the second most played artist at Christian AC-Monitored radio in 2014 and the recipient of multiple industry awards and nominations, including: K-LOVE Fan Awards, Dove Awards, Billboard Music Awards and ASCAP Awards. With a new studio album coming Sept. 18, 2015, the band is still celebrating its career best-selling album, 2012’s Love Come to Life, which has produced four consecutive No. 1 singles, including the RIAA gold certified “Redeemed.” Formed in 2002, Big Daddy Weave is Mike Weaver, Jay Weaver, Jeremy Redmon, Joe Shirk and Brian Beihl. More information can be found online at www.bigdaddyweave.com and follow @bdwmusic on Twitter. A leader in the music industry for more than 60 years, Word Entertainment, a Warner/Curb company, is a unique, comprehensive faith-based company comprised of multi-faceted artist service departments, including publishing, merchandising, booking and online initiatives. Word Entertainment represents some of the top names and brands in music, including About A Mile, Meredith Andrews, Chris August, Francesca Battistelli, Big Daddy Weave, Blanca, Jason Castro, Everfound, Family Force 5, Jon Foreman, for KING & COUNTRY, Group 1 Crew, Love & The Outcome, Dara Maclean, NEEDTOBREATHE, Point of Grace, Sidewalk Prophets, Skillet, Stars Go Dim, Switchfoot, VERIDIA, We Are Messengers, We As Human and Zealand Worship, and is home to 25 Entertainment, Word Distribution (representing Curb Records and Big Idea/VeggieTales among others), Word Church Resources, Word Films, Word Music Publishing and Word Label Group’s Word Records, Word Worship and Fervent Records. Visit www.WordEntertainment.com and follow @WordLabelGroup on Twitter. Nashville, TN (June 4, 2015) —- Powerhouse vocalist, Blanca, made several appearances at the K-LOVE 2015 Ultimate Fan Experience and Awards Show over the weekend. Blanca’s appearances included the artist luncheon, one-on-one interview with Canada’s 100 Huntley Street, CCM Magazine for a June 15 feature, K-LOVE TV and radio interviews, artist autograph line, a presenter at the K-LOVE Awards Show, and walking the red carpet where Blanca interviewed with numerous media outlets. Blanca is still receiving rave reviews and great coverage for her Top Ten new album, Blanca that released May 4th. JesusFreakHideout.com says, marks a promising new journey, while NewReleaseTuesday.com states, plenty here to love, CCM Magazine adds, faith-fueling lyrics and Hallels.com gives the album a 5-star review, great debut release. Blanca is the cover story for the May issue of Parenting Teens and Breathecast names Blanca as one of the industry’s top talents. The first single from the album, “Who I Am,” reached No. 1 on Billboard’s Christian Singles Chart in May and continues to see increased plays on stations across the nation. Blanca will be busy on the tour circuit this summer with festival performances June – August, and these will include Freedom Fest 2015, Jacksonville, FL, J Fest, East Ridge, TN, World Pulse Festival, South Bend, IN, Rock The Desert Festival, Midland, TX, Creation Festival Northeast in Pennsylvania and Creation Festival Northwest in Washington state. For additional tour updates for Blanca please visit online www.officialblanca.com, www.facebook.com/OfficialBlanca, www.twitter.com/TheRealBlanca.